BRAVE King’s Lynn comeback star Lewis Kerr admitted the side was “hurting” after a shock home defeat to Poole. 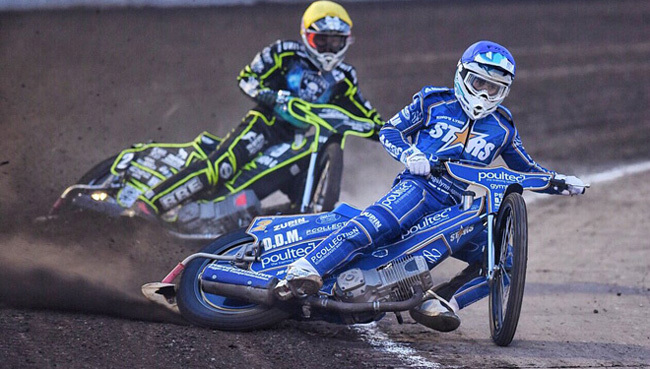 The Poultec Stars, who lost the Premiership title to the Pirates last October, suffered more pain in their opening clash at the Adrian Flux Arena last night. Poole were much sharper from the start and ran out comfortable 50-40 winners in the first leg of the Premiership Shield. Kerr admitted: “We are obviously all gutted. We’ve had a tough start to the season with the defeat at Ipswich and then tonight. “But we can’t let it affect us. It’s just two meetings. Some of the boys are having some niggly mechanical problems which is really stopping them getting top scores. Skipper Robert Lambert is a shadow of his world class ability, scoring just paid seven and admits it’s been a difficult start. The Poultec Stars were rocked with Lambert running last in Heat 1 but the outstanding Erik Riss looked especially quick to win. Then Poole took command with a Heat 2 maximum. However the home side battled hard to re-take the lead in Heat 10 thanks to that Riss and Lambert pairing. But a huge 5-1 for the league champions in Heat 12 followed by a similar outcome of Heat 14 gave the victory to the Pirates. A final heat 5-1 from Brady Kurtz and Jack Holder rubbed salt into the Stars wounds to give the scoreline a more healthy look than it probably warranted for the visitors. KING’S LYNN 40: Erik Riss 11, Thomas Jorgensen 9+1, Michael Palm Toft 7+2, Ty Proctor 5+2, Robert Lambert 4+3, Lewis Kerr 4, Kasper Andersen 0. POOLE 50: Brady Kurtz 11, Nicolaj Busk Jakobsen 8+1, Josh Grajczonek 8, Jack Holder 6+2, Richie Worrall 6+1, Nicolai Klindt 6, Nico Covatti 5+2.